1. Cook McCain Superfries Shoestring as per packet instructions. 2. Evenly divide cooked McCain Superfries Shoestring among 4 oven-proof, serving bowls. Top with refried beans and cheese and place under a hot grill until the cheese is melted and bubbly, approximately 1-2 minutes. Top with salsa and sour cream, and garnish with olives, and shallots. Serve. 1 Cook McCain Superfries Shoestring as per packet instructions. 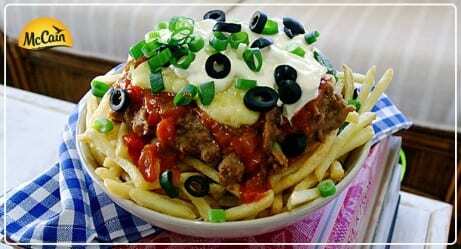 2 Evenly divide cooked McCain Superfries Shoestring among 4 oven-proof, serving bowls. Top with refried beans and cheese and place under a hot grill until the cheese is melted and bubbly, approximately 1-2 minutes. Top with salsa and sour cream, and garnish with olives, and shallots. Serve.